It's no surprise that dirty restrooms can lead to lost business. In fact, a recent Harris Interactive survey revealed that 94 percent of U.S. adults would avoid a business in the future if they encountered dirty restrooms. However, there is a common misconception that cleaning and disinfecting are the same. To alleviate any confusion on proper cleaning protocol, Cintas Corporation issued a list of best practices to help business owners create a pleasant, sanitary and healthy restroom atmosphere. 1) Know the difference between cleaning and disinfecting. The first step to provide a clean restroom is to understand the difference between cleaning and disinfecting. Cleaning removes visible soil, dirt, stains and other debris from surfaces. It is typically performed by wiping surfaces using soap and water or a multi-purpose cleaner. Disinfection destroys viruses, bacteria, germs and other harmful microorganisms. It is accomplished by using a chemical designed specifically to kill bacteria. 2) Always clean before disinfecting. An unclean surface cannot be disinfected. Dirt is a hiding spot for bacteria and rapidly depletes the sanitizing capability of disinfectants. Therefore, thoroughly clean all surfaces to remove soil and stains before applying a disinfectant. 3) Identify all restroom touch points. Before cleaning a restroom, identify all "touch points." Touch points include objects that people touch on a regular basis such as door handles, soap dispensers, stall locks, paper towel dispensers, etc. At minimum, these surfaces need to be cleaned and disinfected on a daily basis to prevent the spread of germs. Areas in restrooms that users do not generally come in contact with, such as windows, may only require cleaning. 4) Select the right chemicals. There are several cleaning chemicals on the market and it is often difficult to identify the best-performing products. For cleaning purposes, select an ammonia-free glass and multi-surface cleaner that is highly concentrated and Green Seal certified. An ammonia-free product is ideal as it has a lower odor than other products. For both cleaning and disinfecting, select a heavy duty, non-acid washroom product that is cleaner and disinfectant in one. 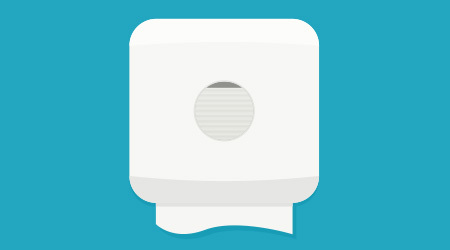 This will kill bacteria and reduce odors commonly found in restrooms. The product should also have high alkalinity for easy soap scum removal. When using a two-in-one product, users must spray the chemical twice to work properly - once for cleaning purposes and once for disinfecting. 5) Allow disinfectants to dwell for the appropriate amount of time. All disinfectants have a dwell time and must sit on a surface for the allotted time to work at maximum efficiency. Simply spraying and wiping doesn't give the chemical the time it needs to kill 99 percent of the bacteria. Most products require a dwell time of 10 minutes or longer. Read all labels and educate cleaning personnel to follow the guidelines. Encourage employees to spray the disinfectant and complete another task, such as emptying the trash, to allow the appropriate amount of time.